Veteran truckers are fully aware of the high standards that employers hold over commercial drivers. The expectations are that professional truck drivers will demonstrate the utmost care in terms of safety and following the rules of the road. Both veteran CDL holders and those just beginning a high-paying career in the trucking industry would be wise to understand how moving violations can negatively impact their employment opportunities. Although moving violations differ from state to state, they can have a significant effect on your ability to earn a living or secure your perfect truck driving job. While most veteran truckers are acutely aware of the impact a moving violation can have on a CDL license, those new to the profession would be wise to steer clear of tickets. States generally use a point system and assign a varying number based on how severe they deem an infraction. It’s important to keep in mind that each state applies points differently and the impact on your ability to operate a commercial motor vehicle (CMV) is not necessarily uniform. That being said, moving violations against your CDL are not just a matter of citations while driving professionally. Moving violations while driving on your on personal time can also be pitted against your CDL, and that means these could also result in your inability to earn a living driving over the road. Although each state varies in its point count, consider this common but generic point system for speeding citations. Although this scale represents a middle of the road point system, there are others that are more severe. Virginia is considered among the states that strictly enforce speeding laws, according to compiled traffic data. Speeding results in 6 demerit points for tickets above 20 miles over the limit among other moving violations. The state could automatically suspend your CDL if you accumulate 12 points over a 12-month period or 18 points over 24-months, according to the Virginia DMV. By contrast, Texas is generally considered among the more lenient states in terms of speeding enforcement. If a truck driver receives a speeding citation of any type, the state assigns a standard two points per infraction. However, four points within 12 months or seven points within 24 months can result in your license being suspended, according to the Texas DMV. The common denominator is that speeding results in points against your CDL. It’s easy to see by looking at the different approaches these two states take that the pitfalls of moving violations can quickly put a professional truck driver on the sidelines. The Federal Motor Carriers Safety Administration (FMCSA) provides a comprehensive list of violations that are attributed to carelessness. Its Compliance, Safety, Accountability (CSA) enforcement program reviews the more technical aspects of hauling freight. This can be particularly problematic for drivers who are gaining experience about the practical methods used by truckers. If you are issued a citation on one or more of the FMCSA’s safety violations, your CDL could be in imminent danger of suspension. These are some of the hefty demerit points that accompany common safety violations. 10-Point Citations: If your vehicle is considered out of service due to an expired inspection sticker or other deficiency, you could be severely impacted. 8-Point Citations: Generally associated with violations of airbrake restrictions or worn tire treads. 7-Point Citations: Generally related to lack of proper seatbelt use, tie-down deficiencies, and improperly secured or managed loads among others. 6-Point Citations: Generally associated with inoperable headlights, taillights or turn signals. Other 6-point violations may include power steering deficiencies. 4-Point Citations: Generally associated with failure to have a pre-trip inspection and faulty braking systems among others. 3-Point Citations: Generally associated with failing to dim headlights, lane restrictions, inadequate reflectors, and a variety of defective mechanical mechanisms. To say that the list of CSA violations is lengthy would be something of an understatement. In fact, the list is downright exhaustive. The FMCSA expects that every vehicle and load will provide optimal safety while being transported. Suffering just two CSA point demerits could result in a CDL suspension. Along with strictly enforcing the mechanical aspects of driver safety, the FMCSA is also tough on other moving violations. Given that truck drivers are entrusted with large loads and the most powerful commercial vehicles on the road today, there are incidents that can be handled with little or zero tolerance. These are some of the common reasons a CDL holder could be disqualified from employment. 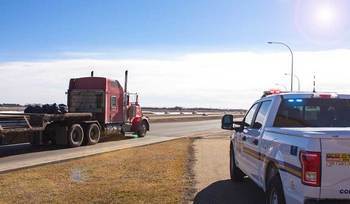 Excessive Speeding: This type of moving violation is almost on par with recklessness in the eyes of many law enforcement officials when driving an 18-wheeler. Individual states may also impose sanctions against your CDL if you are ticketed in a personal vehicle. Leaving the Scene of an Accident: This type of incident can be problematic for big rig drivers because they may not realize their rear tires impacted another vehicle when turning. However, it can result in automatic CDL suspension. Drunk Driving: It’s important to keep in mind that truck drivers are held to a higher sobriety standard. A truck driver’s blood alcohol content may not exceed 0.04. You could also have your non-commercial license suspended as well. DWI: Like DUI, driving while impaired relates to any controlled substance used while driving. Law enforcement generally treats these with similar prosecution and loss of CDL is always on the table. Criminal Conduct: If a driver uses a commercial vehicle while in the commission of a felony, CDL disqualification is likely. Illegally transporting or possession of a controlled substance would be an example. Along with these safety-oriented reasons, operating with a suspended or revoked license and repeat offenses may also be a reason to disqualify you as a commercial truck driver. These disqualifications can range from 30 days to a lifetime depending on the severity of the infractions. If you have been out of work due to a temporary disqualification, CDLjobs.com could be an excellent resource to help you find gainful employment. Although it may seem unfair to hold drivers to different standards than other motorists, CDL holders must walk a straight line and always follow the rules of the road. And infractions while driving a personal vehicle matter. These are some of the substantial violations that could result in loss of your CDL. Repeated speeding tickets while driving a personal vehicle. Driving under the influence of drugs or alcohol. Drivers who a learning the ropes would be wise to apply the same high standards of their profession to their personal life. When it comes to driving truck, everything counts. Trucking companies put significant emphasis on the Drive-A-Check (DAC) report when hiring CDL holders. This detailed background check highlights a person’s driving history. It generally includes previous driving infractions, employment history, criminal behavior, and accidents. The DAC report is an important item for truck drivers to be aware of and be certain it includes only factual information about moving violations. If you fought a speeding ticket in court and won, for instance, it’s in your best interest to make certain that incident does not appear on your DAC report. Moving violations are a primary concern for trucking companies when hiring new drivers. Having the cleanest possible driving history will help you when applying for truck driving jobs.